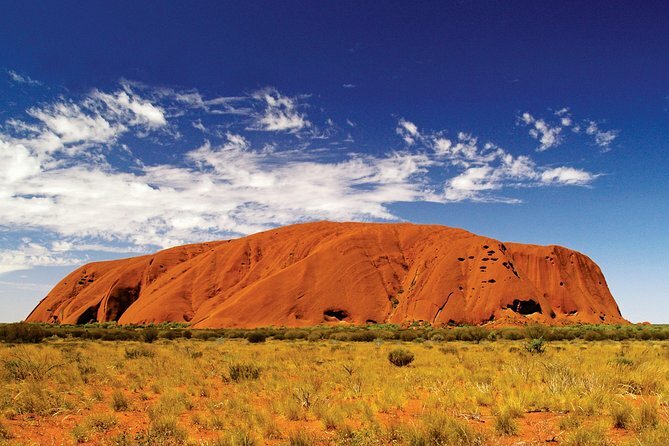 Travel from Uluru (Ayers Rock) to Alice Springs in a deluxe coach with a professional driver who shares informative commentary about the sights you pass during the 6-hour journey. Avoid the worry and expense of flying or renting a car and leave the driving to the professionals with this one-way transfer that provides door-to-door service in a comfortable air-conditioned coach. Bonus: have the chance to spot wildlife and view more of central Australia’s magnificent landscape, including Mount Conner (Attila) and the West MacDonnell Ranges. Your luxury coach picks you up at your Ayers Rock hotel early in the afternoon. Meet your driver and get comfortable in the air-conditioned coach, which provides spacious seats and ample luggage storage. Travel east from Yulara via Curtin Springs, an enormous family-owned cattle station that has been in operation for more than 60 years. Look into the distance to see the bulky form of Mount Conner (Attila) as your coach continues east to Erldunda. Stretch your legs during a rest stop at Mount Ebenezer Road House. You can also browse artworks made by local artists from the Imanpa (Aboriginal) community and purchase tea or other refreshments. Then connect to the famous Stuart Highway, the principal north-south route through central Australia, and ride along a 124-mile (200-km) section of this key road to reach Alice Springs. View the impressive West MacDonnell Ranges, another example of this area's intriguing geological evolution. This 500-million-year-old mass of twisted quartzite stands as one of Central Australia's most dominant land forms, and is riddled with deep gorges and chasms. Listen to informative and entertaining commentary provided by your driver as you travel through striking Outback landscapes. Learn about the geological history of the region, Australian desert flora and fauna, and some of the traditional customs and beliefs of the Aboriginal people who have inhabited this area for more than 20,000 years. View groves of desert oaks, many of which are many hundreds of years old. These resilient trees survive in the harsh climate by sinking tap roots deep into the earth and remaining dormant until water is found. You may be able to watch an onboard video about Australian wildlife. You can also keep an eye out for critters in the desert as you travel. Please note: You may transfer coaches at the Kings Canyon junction before continuing to Alice Springs. It went smoothly and we had an great experience with the to drivers Pete and Mark. They had so much fun and told a lot of great small story’s about the place that you haven’t heard before. We thoroughly enjoyed the bus trip from Uluru to Alice Springs. We had the services of Dan, the driver guide. He was terrific and kept us entertained and informed throughout the trip. He had a great sense of humour and an excellent historical knowledge. We had a short break at expansve Curtin Springs and a stop at Ellgunda Station both of which gave us a good indication of the size and scope of these outback cattle stations. This trip --a 6 hour road trip between Uluru Ayers Rock and Alice Springs was very well done and involved a transfer of buses half way through our journey part of the group went off to see Kings Canyon. Both of the drivers were excellent and provided outstanding customer service and terrific commentary. There were also several apprpriately timed toilet stops at cattle stations along the way. Terrific tour! More than just a shuttle service from AAT Kings! Easy and comfortable way to get from Yulara to Alice Springs. We stopped a Curtin Springs for refreshments and had a nice view over to Mount Connor, where we tasted bush tucker berries underway. This trip was very successful for us. We were collected exactly on time, the bus was very comfortable, the driver very friendly and informative and arrived on schedule too. We were brought from door to door of our hotels on both sides. Overall a worthwhile experience and good value for what we received. This was a very enjoyable trip. The driver was very knowledgable and we really enjoyed his commentary. This was just a bus trip. Nothing special. Seats were comfortable. Stopped twice to let us stretch our legs. Supposed to provide guided information but the speaker/guide for first half of trip was bored, terse, uninterested. She was replaced by another guide half way through he trip, and at least he knew some history about Alice Springs, and talked to the passengers knowledgeably for about 5-10 minutes total out of 5 hours. Do not consider this a guided tour or trip. It is just a comfortable bus ride that seems somewhat overpriced. Quicker to take a plane, and not much more costly.